Airbag - Driver,Airbag - Passenger,Side Airbags,Roof Airbags,Air Conditioning,Anti Theft System,AM/FM Radio,AM/FM In-dash Single CD Player With MP3,Satellite Radio,Premium Audio System,12V Power Outlet,Backup Camera,Four Wheel ABS,4-Wheel Disc Brakes,Onboard Hands-Free Communications System,Cruise Control,Rear Defrost,All Wheel Drive,Vehicle Anti-theft,4 Cylinder Engine,Floor Mats,Fog Lights,Gas,Auto Delay Off,-,Remote Keyless Entry,Power Locks,Electrochromatic,Heated Mirrors,Power Mirrors,Vanity Mirrors,Remote Engine Start,Heated Seats,Manual Adjustable Lumbar Support,Power Driver Seat,Fold Down Rear Seat,Front Bucket Seats,Tilt Steering Wheel,Steer Wheel Audio Cntrls,Leather Wrapped Steering,Power Steering,Bluetooth Connection,Tire Pressure Monitoring System,Compact Spare Tire,Traction Control,Trip Computer,Power Windows,Intermittent Wipers. 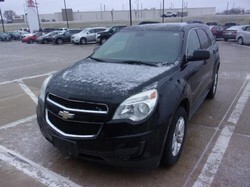 Hello, I would like more information about the 2015 Chevrolet Equinox, stock# 22757A. Hello, I would like to see more pictures of the 2015 Chevrolet Equinox, stock# 22757A.